Who hasn't called their dad at 11 a.m. on a Tuesday and asked him for a bucket of soybeans? You have NEVER done that, really? Hmm...I have to admit that I've done it more than once and he ALWAYS comes through for me. That's just the kind of dad that he is. He even put up signs in his soybean fields JUST because I asked him to. He's the best! He even loaded the bucket of soybeans into my car last night. 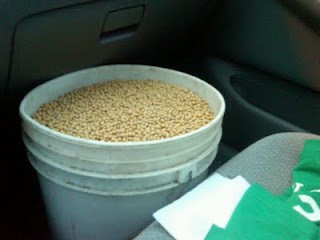 Doesn't everyone have a bucket of soybeans riding shotgun in their front seat? You've NEVER had a bucket of soybeans in your car, huh? Go figure! Want to see these incredible beans in person? You can! 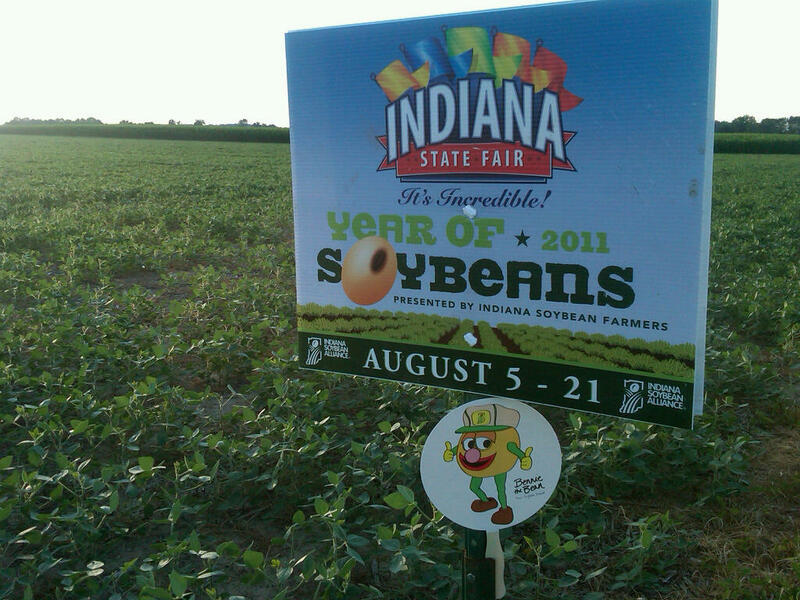 Year of Soybeans at the Indiana State Fair starts on Friday and you can find the soybeans in the bucket above at the Incredible Soybean Exhibit in the Pioneer Our Land Pavilion! 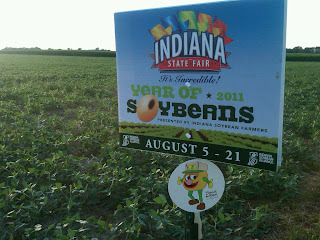 Check out the Indiana State Fair page for more details about SOYBEANS at the Fair. Want to win some tickets to the Fair? Check out Indiana's Family of Farmers blog and Bennie the Bean's FB page (starting Wednesday) or his Twitter page (@BennietheBean). When I am riding with a bucket of beans in my vehicle, I usually spend most of my time praying they won't spill! Have a great time at the fair! You have put in tons of hours, hard work, sweat, and I am sure a few tears. The PR has been AWESOME! YOU ROCK! Saw your signs the other day on our drive! If you want some in Johnson Cty - bring them on by we have lots of bean fields we will put them up in! never seen a soybean before! what do you do with all of them? haha i think it is one of the best days of their (the beans) life! they didn't know that the fair IS the best thing!